In this self-paced 21 Day program, you get to watch a 30 minute video session or download the audio version of the session and receive the energetic transmissions that will change your sense of personal power, embody more joy and connect with the energy of money so that you can generate more money. In every session, healing work will be done from the space of the Akashic Records (vibrational library of all your life times) so that change happens in the past, present and all future time lines. Issues in your tissues, DNA, Akashic Records, lineage, Chakra system, meridian systems, subconscious mind and other hidden blocks will be released to the Light. You will be guided to reprogram your subconscious mind with beliefs that support you to embody personal power, experience a flow of joy and have more financial abundance. Hidden loyalties to family and belief systems will be released. Work with your Inner Child will be done gently so that you have a new experience of what is possible to create. You will be empowered to create changes in any area of your life that you desired. You will also be able to participate in 3 live zoom hangouts that are 60 minutes duration with another 15 minutes for q and a. If you like, you can also join my FB group for support. Day 1 How to work with your subconscious mind. You will be shown how to work with your subconscious mind so that you can begin to reprogram your beliefs to help you have more personal power, money and joy. Of course, you’re welcome to use this to reprogram your own subconscious mind to support you in any way you choose. Day 2 Align all Chakras with power, money and joy. Energy transmission to clear all your chakras of old limiting beliefs and align them with beliefs that support you to have more personal power, money and joy. The main focus is on the first three chakras because they contain much information from our tribal programming. Hidden loyalties to family and belief systems often compromise our personal power in favorite of giving power to an authority out side of ourselves. This is so that it’s easier to create social harmony in the past. Now each of us must take back our power so that we are no longer subconscious programmed to just function as “slaves and servants” to a belief system. Like the idea of a money-set point, our hidden loyalties to family and belief systems often create a relationship with money that disempowers the individual. What if you no longer have to have a money set-point? What if you no longer have any point of view about money? Just as there is a money-set point, many of us have an invisible joy set-point. You know you have one when drama often follows something good. It’s like you’re always waiting for the other shoe to drop. What if you can release these hidden loyalties that keep you from your joy? Joy is not just a high vibration emotion, it’s a state of being that allows you access to all of your being. Who will you allow yourself to be? Many of us fear the idea of having more power but we like to accomplish more and experience more in life. When you release the subconscious blocks to personal power, you have more choice, you’re able to follow through your choices with action and you become more effective with your own actions and words. What if you no longer have any money-set points? What money dramas will you be able to release? If having more and more money is no longer an issue, what will you be able to create and how will your self-esteem change? Joy is a powerful state of being that allows you access to your whole being. What are you able to change, create and generate in your life when you have access to your entire being, your full potential and creative abilities? What if nothing and no one can keep you down anymore? Day 9 What is being power to you? We all have power and super powers. What is being power to you? Having clarity about this allows you access to your own power. Day 10 What is being money to you? Money is a neutral energy and how you choose to play with it will program how money will show up in your life. Are you able to see yourself as someone with money? Are you willing to allow yourself to have more money with ease? What if having money has nothing to do with how hard you have to work? Day 11 What is being joyous to you? Will you allow yourself to be a joyous being? What if you can have all the cells in your body remember what joy feels like? Your Inner Child knows your own super powers as well as your personal power. When you allow yourself to cultivate a relationship with your Inner Child, you’ll be more and more comfortable with being the powerful being that you are. What does your Inner Child know about how to make more money? Have you betrayed her? We will work gently with your Inner Child to let her know that you’ll be taking good care of her from now on. When did you first give up on your own dreams? Your Inner Child knows what a joyous life looks like. We will work with your Inner Child to let her share with you what she knows about creating a joyous life. Day 15 Who are you with money, power and joy? Can you see yourself as a joyous person with money and personal power? Sometimes we think “other” people have the power and the money and we will have to reprogram ourselves to see and be the person we can be with money, power and joy. What three words describe your current money story? How does it make you feel? What three words would you like to be able to use to describe your new money story? How can you be congruent with this new money story? What three words describe your current power (powerlessness) story? How does it make you feel? What three new words would you like to use to describe your new power story? How do you like to feel and how can you become congruent with this new power story. What three words describe your current joy (joylessness) story? What three new words would you like to use to describe your new joy story? How do you like to feel? How can you become congruent with you new joy story? What is your new money story and how do you feel when you tell it? What changes do you have to make to be congruent with this new money story? What if there’s no limits to what you can have? What new personal power story would you like to create? How does this new story make you feel? What changes would you like to make to become congruent with having unlimited personal power? How would you like others to treat you and see you? How would you like to show up in the world? Yes, you can be living in a joyous new reality. What do your relationships look like in this new joyous reality? What does your surroundings look like? How do you feel about yourself? Are you willing to allow yourself to have more joy, personal power, money and more ease with everything? Celebrate your new joyous reality. January 26, 2019, Saturday at 11 am mountain time. An hour zoom hangout with a 15 minute q and a session to support your journey. February 2, 2019, Saturday at 11 am mountain time. February 9, 2019, Saturday at 11 am mountain time. I was attracted to Jade just for working on my eyes and experienced soooo much more! Jade worked on my C2, left eye pain and even a tooth that were all connected to the eyes. I have been putting in multiple hours in front of the computer and my eyes were getting fatigued. I took a nap after our session and was then up most of last night… no blurry eyes or fatigue like I would normally experience! Jade mentioned my ancestral and womb experiences. She pinpointed an upset at approximately 6-8 weeks in utero… the result being that I felt like I was not seen, not heard and when I was born that I did not feel well received and loved. What Jade picked up on was when my father was suddenly drafted and was to be sent immediately to the Front in a war zone. “I was thinking about giving up on everything, feeling super anxious, frustrated and pissed but I saw a post to win a Backstage Pass with Jade and I have seen her face online before and was always drawn to her, so I entered and I won. I took it as a sign from the Universe to keep trying and that maybe things are finally turning around for me. I asked Jade to work on my finances as I had only one dollar at the time of the phone call with rent and bills all due or overdue. Lack has been a lifelong issue, even after studying and practicing the laws of prosperity. Jade was amazing and exactly what I needed to help me revive some hope inside. She was so smart and kind and funny. 20 minutes goes by so quickly and she immediately helped me to release negativity, old patterns, limiting thoughts, entities and I could feel through the phone. My hands and cheeks were buzzing with energy and a weight of anxiety lightened in my chest. Jade had insight into me having to play small to survive life in my family and she did a healing to clear any blocks growing up like that can cause. She has such a calm soothing, reassuring way of reprogramming limiting beliefs. She has a great sense of humor and had some funny ways of reprogramming the limitations I imposed on myself. I didn’t realize that’s what she was doing with me until later. I just instantly trusted everything positive she stated about me as being true. accent similar to the one that scarred me so deeply ( not intentionally, but she did) as a little girl was extra healing for me. Although, you don’t need an Asian mama to enjoy Jade! 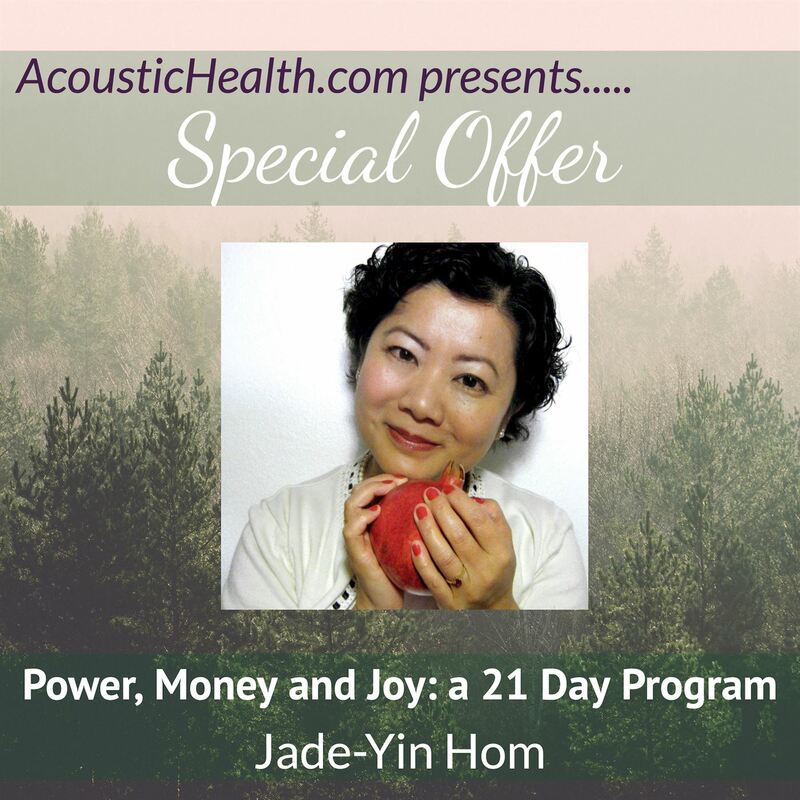 Jade Yin Hom is truly the most Gifted Healer, her energy and warmth puts you at ease immediately, and her compassion, wisdom & clairvoyance is astounding. From the very first skype session I had with Jade, I knew I was in the presence of a very special Energy Healer & Gifted Intuitive. Initially I was drawn to Jade’s 21 Day Money Magic & Miracles program, to help transform my financial blocks. I soon learned that within this program Jade gives so much more than just clearing money blocks. Jade channels amazing multi-dimensional loving energy & she brings through such beautiful healing, emotional clearings and transformational energy shifts. Jade’s healing work incorporates many generations, to get to the root of the issues. Within the 21 Audios alone, Jade brings through Higher Energies that shift Self Love blocks, shift Ancestral patterns, and connect us to our Higher Self. My words cannot do justice to how beautiful these Audios really are. I cannot speak highly enough of the Live Video Sessions called Zoom hangouts that Jade offers in her programs. These sessions were life changing for me, as Jade generously shared how to shift un-conscious blocks using a profound yet very simple techniques. Every Divine Audio, every Group process and every 1 on 1 Session with Jade is a precious gift you will never forget. Thank you Jade, you truly are a God Sent Gifted Healer. I appreciate you with all my Heart! “Jade is so wise, funny, real and humble . I get picked out on a tele summit call and received Jade’s healing. (Also: even before the tele summit-call started I was already feeling subtle energies moving in and around me.) I told Jade about my problems like major depression, chronic fatigue and mental confusion. During the live healing session, I felt a warm ray of energy moving from my heart area to my throat, while she worked and talked about the Assemblage Point. After that, I felt subtle, but very strong electrical waves of energy in and around my body, in my hands, my chest, my legs and feet. Now, a week later that blanket of energy has become stronger and has not left me! I do feel lighter and closer to myself. The energy feels pleasant and empowering for my physical body. I always wondered what people were talking about when they say: ‘ Yes , I can feel the energy… ‘ Now I understand , because I felt it while Jade was working on me and even a week later I can still feel energy moving around my body. I felt lighter after Jade infused me and my Assemblage Point with light. Lighter in spirit mind and body. What a miraculous thing this is! Jade’s energy was very tangible even during a distant healing session. I can even feel my eyes changing in the inside. I truly loved my healing session with you. It’s amazing to me how much can be worked on in such a short amount of time. Less than 24 hrs. after my session I could feel real results. I came to Jade with a litany of problems: chronic fatigue, skin and fungal issues, tightness in my chest, severe digestive issues due to incredible amounts of stress over that past four years and more. I had lost both of my brothers at a young age to heart attack and had taken on the burden of my family and more. One of the first things Jade worked on was the miasms related to heart issues. The tightness around my chest immediately disappeared and the cough I had loosened up, and as of today has disappeared. I’m breathing more freely now. I only had about 5 hrs. of sleep overnight, worked a 10 hr. day, and I still have more energy left at the end of my day then after a full night’s sleep. I feel there is more of a flow of energy coursing through my body. Most of my issues were related back to 23 generations of abusive patterns that needed to be cleared. How can you quantify having that cleared? It’s priceless to be free of burdens and ties that were never mine to begin with. Jade, I am deeply touched by your generous loving spirit, your insights are so spot on, you tuned into every problem within my physical body without my help. What I’m most impressed about is your Authenticity. That word is used a lot these days, but most people could take a lesson from you, because YOU ARE IT.